The Model-1840 Musician's Sword does not appear above. It might be easy to believe that swords and sabers were obsolete by the time of the American Civil War (1861-1865). In truth, large numbers of them were manufactured, issued and worn. They served many functions beyond that of a weapon. Officers' swords, all of which were privately purchased, were a badge of rank and status. The various types in service helped identify the branch and grade of the officer carrying it. Cavalry sabers were still practical weapons, as attested to by the records of soldiers wounded cavalry clashes. In fact, it may be true that injuries inflicted by sabers outnumber those by bayonet and this despite the popular infantry assault doctrine of the period, borrowed from French theorists. Volunteer soldiers appear to have had reservations about using the bayonet and their officers may have felt that hand-to-hand fighting resulted in a fragmentation of the fighting formation of their units. Other enlisted swords that were carried by infantry or artillery soldiers included: the non-commissioned officer's sword, musician's sword, foot artillery sword and light artillery saber. These saw very little practical use and were mostly ornamentation. 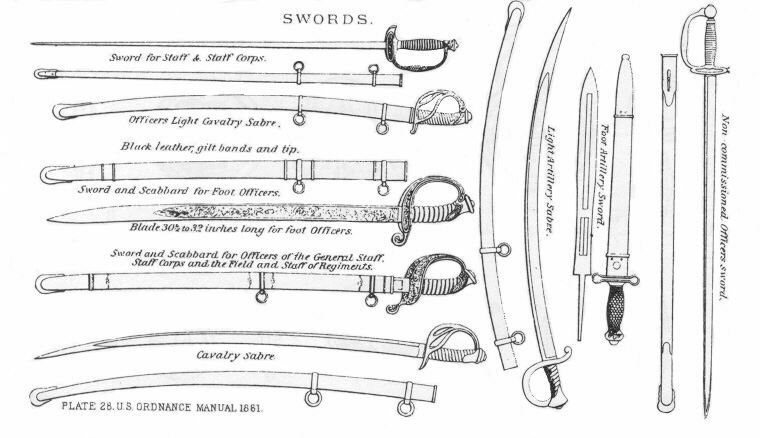 American military swords were not very standardized prior to 1840. Officers' swords were described in vague terms, as having brass or silver mountings. Enlisted swords were issued and based on the specifications given to the manufacturers, mostly William Rose of Philadelphia and Nathan Starr of Connecticut. Most of the blades of officer's swords were imported from Europe and the hilt manufactured by domestic craftsman who were silver smiths by trade. State militia officers wore most of the existing pre-Civil War officer eagle pommel type swords. There was little domestic production of enlisted swords and sabers during the 1820-1840 period. The United States Regular Army lacked a mounted branch during most of those years so there was little need for sabers. Such need that existed for enlisted swords was satisfied by European imports and existing stocks. In 1840 there was a decision to reform the swords used by the Regular Army. This may have been prompted by the creation of the dragoon regiments during the 1830s and dissatisfaction with the model-1833 Dragoon Saber design. In 1839 the War Department ordered a number of European edge weapons of various designs for testing. It convened a board of officers by authority of an order issued August 28, 1840 to study the various European designs. An order was placed with the German firm of Schnitzler and Kirschbaum in Solingen, then the leading center of blade production in Europe, for a quantity of the various designs chosen. The swords were delivered in 1841 and became the model-1840 pattern for many of the sword types used for the remainder of the 19th Century. These included the cavalry sabers, non-commissioned officers swords, musician's swords and light artillery sabers. The NCO swords and musician swords were a hybrid of French and German models. The light artillery saber was based on the Model-1829 French model. The model-1840 (old wrist breaker) cavalry saber was based on the French model-1822 pattern. A redesigned model that was lighter by about a pound and better balanced is often called the model-1860 cavalry saber (despite the fact that the first production was in 1857). However, because of existing stocks the Model-1840 cavalry saber was heavily used during the Civil War and was still the model pattern used by the European exporters. Officer's cavalry sabers were similar to the enlisted model but had ornamentation of the hilt and etching on the blade. One major enlisted sword type predated the 1840 reform. This is the model-1832 foot artillery sword. This sword was based on a French pattern that in turn was based on the classical Roman short sword. Of all American weapons this one would appear to be the least practical in design. However, many believe that artillery men put this weapon to other uses, such as clearing brush or cutting traces. It would be interesting to see good documentation for such use if it in fact occurred. The last production of this sword was in 1862 and it fell out of use during the post-Civil War period. The various swords worn by officers evolved from 1840 to 1861. Distinct swords for the medical and pay departments were introduced in 1840 and used until 1902. In 1850 two swords were introduced: one for foot officers and a second for both staff and field officers. Ten years later the Model-1860 Staff and Field Officer's sword was introduced and officers given the option carrying either the 1850 or the light weight model of 1860. In 1872 the Model-1860 Staff and Field Sword superseded all other officers' models, except for medical and pay types and those of mounted officers.